Spiritual Every-Flavour Jelly Beans Anyone? Everyone has a third eye they can use. It’s easier than you think. Just be playful and creative, have fun. Your third eye can give you an input based on all your senses that you can understand, through visuals, sounds, smells, tastes, and tactile feelings. For instance, in the first Harry Potter film, Harry is given a packet of Bertie Botts Every Flavour Beans. Now it’s easy to imagine beans representing something you want some information on. I quite like to look at political parties, or politicians (some of those beans can taste really disgusting!). I like to to take a look, or a taste, of organizations; try the NSA, or CIA, or MI5, MI6, or the Russian or Chinese or Israeli, secret services. Imagine their leaders as beans. The head of the Iranian army is a dark old flavour, though he is being used in interesting ways in the chess game of life. Looking at organizations and people in this way can throw up some interesting information (hang on to your taste buds though, while some can taste fine, others need a bit of mouth rinsing). The Every Flavour Beans approach works on many things, how local schools taste, the taste of local shops and supermarkets, charities, banks, media companies, oil and chemical companies, pharmaceuticals, financial businesses and their products, and countries. It works on commodities, such as tea or coffee products, where the taste of the beans correspond to living and working conditions of the workers (a lot of karma being drunk with some teas and coffees) and impact on the environment. You can try products from different countries where different rules apply. For instance, where the products are genetically modified, pumped with antibiotics and growth hormones. Or whether the products are free range or organic. There is an energy input with food, not just a physical, nutritional one. Plus there is karmic input (just see how animals are treated worldwide, watch the film Lucent about pigs). So, even though the beans idea is a bit of fun, it can be used to consider some serious stuff. While some people and organizations have your best interests at heart, there are some dark lodge orientated ones that don’t, though they might claim to. 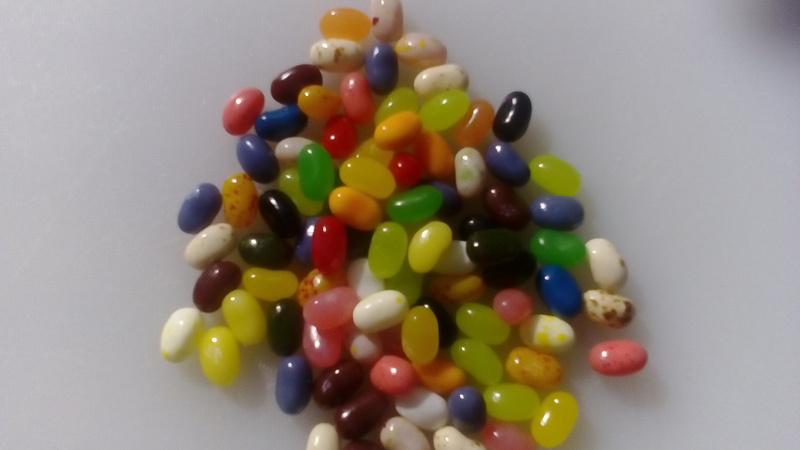 Jelly beans are great, they can help to inform you, and inform your choices. A slightly different kind of meditation. Spirituality, slightly drunk on light. You sit on the warm, white sand of a beach overlooking the Ocean. It’s first thing in the morning of a new day. You are looking at the sun of a new dawn. You can feel the warmth and light of this brand new offering soak into your skin. You feel like a drink and ask the Divine bartender for something to quench your thirst (for knowledge!). They look eye-catching with their long glowing white hair, and golden eyes. They take a tall crystal glass, and pour in a splash of bright white light, which is bliss with a hint of infinity. Then they pour in an electric blue of grace, with a moreish aftertaste that lasts and lasts, guaranteed to tickle your soul. In goes a dash of gold, full of bubbles. This drink is a dream. The bartender, with a gleam in their golden eyes, passes their elongated hand over the top of the drink, and in goes a rainbow. Finally, they place in the glass a stick which could be a palm tree, but looks more like the tree of Life. They pass you the drink, which glows a little, and you drink, and drink again. The Divine bartender watches. Some people sip, while others drink in one. In all, something happens to their heart centre, and more. They feel it from the top of their head, to the tips of their toes, and in all in between. All the while the new dawn sun shines on them with a big constant hello (some people on this beach of white sand notice a little sun growing in their heart). Well that was some drink. Often the happy beachgoer might ask for another. The Divine bartender ponders what to mix in this brew. Or the beachgoer might ask for a tea, or a coffee to sober up. The sun of the new dawn shines onto the beach of white sand.